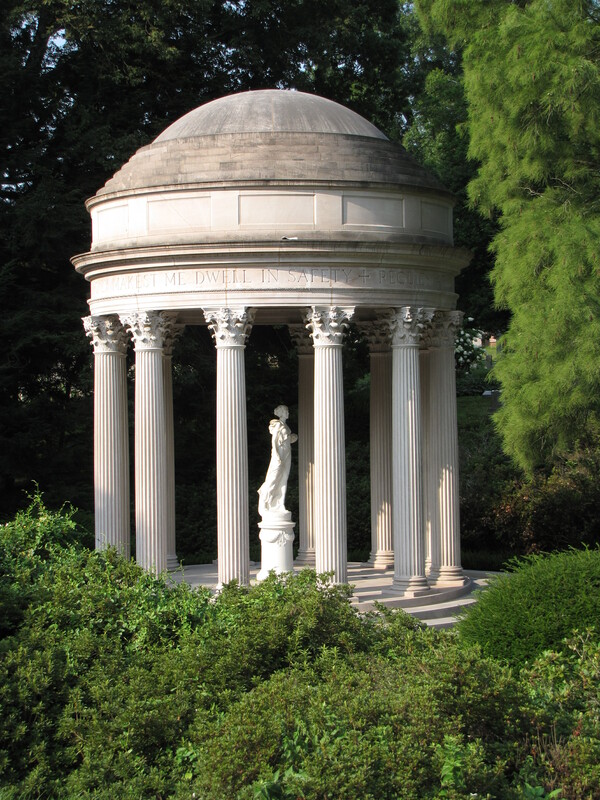 Horace Trumbauer, noted Philadelphia architect, was hired by the prestigious Dr. Preston Pope Satterwhite of Louisville, Kentucky, to design a memorial for his late socialite wife, Florence Brokaw Martin Satterwhite. Trumbauer based his design on the Temple of Love at the Palace of Versailles created by Richard Mique specifically for Marie Antoinette. Mique oversaw the building of the last of the monuments at the Palace before the French Revolution and the fall of King Louis XVI. For his part in what was thought to have been a conspiracy to save Marie Antoinette, Mique and his son were found guilty by a tribunal and sentenced to death—three weeks before the end of the Reign of Terror. 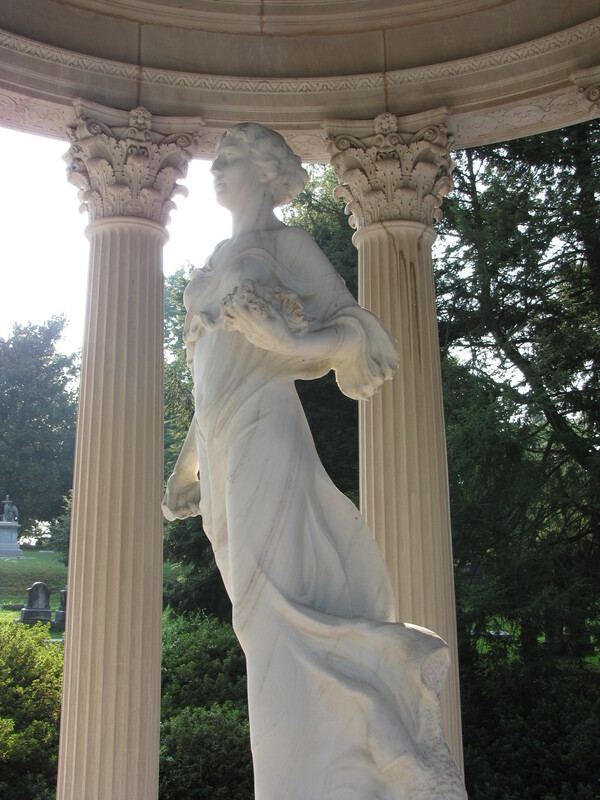 The statue inside the memorial was created by Sally James Farnham, the same artist who created the Vernon and Irene Castle memorial at Woodlawn Cemetery at Bronx, New York. Farnham was well known for her heroic 15-foot statue of Simon Bolivar in Central Park. Unlike the delicate Castle commission, this statue is commanding and large. 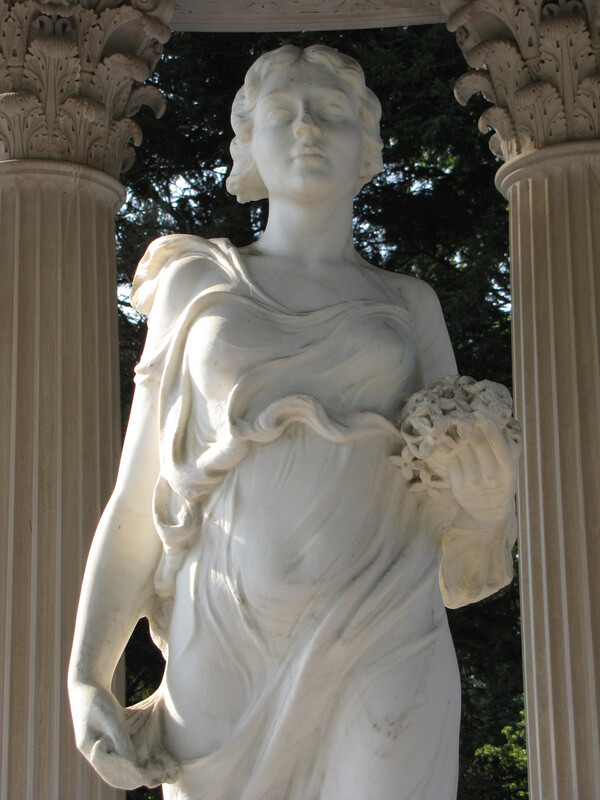 The centerpiece of the temple is the statue of Flora, indicated by the bouquet of flowers she holds in her left arm. Farnham designed the statue and it was sculpted in marble by Robert A. Baillie. What is also remarkable is that Sally was entirely self-taught—she had no formal training, and yet, created magnificent sculptures that show range from the massive equestrian statue of Bolivar to the tender and delicate collapsed dancer to the centerpiece of Satterwhite memorial.